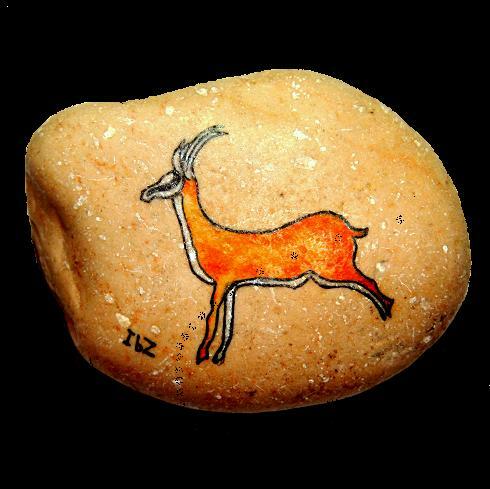 "...A time to gather stones together..."
As an Art History student at the Hebrew University of Jerusalem, I was looking at numerous reproductions of Northern petroglyphs, South Africa’s rock paintings, Stone Age European murals, and drawings covering Caucasian cliffs. I was astonished by both the beauty of the images and that of the surfaces on which these images were painted, engraved or drawn. Something inside me, some inner voice was whispering to me that this art was not for aesthetic needs only; this was a forgotten language once understood by human beings. Dwelling in their megapolises, people today have lost touch with the Earth, Water, real Air and have almost forgotten this ancient speech. I was trying to learn this language by reading numerous books about history, art history, mythology, archeology, symbolism, ethnography and linguistics. Apparently all early civilizations and cultures were using the common system of signs and symbols, based on few common concepts. Ancient people painted on rocks and stones, as well as on cave’s walls similar signs and symbols, depicting Great Goddess - Mother Earth, Water and Fire; Act of Creation (the Bird and the Egg); the Sky and the Rain; the Sun and the stars; the Axis Mundi - a Tree of Life; the Upper and Lower Worlds... People drew hunting scenes, symbolizing Power and sexual might; herds of Elks, Goats and Sheep, myriads of fishes - symbols of Plenty, Fertility and Health, as well as images of seed, crops, and grains. Little by little, this ancient language became clearer to me. A moment came when I, as an artist, understood that I have to express my accumulated knowledge in a visual art form. I was desperately looking for appropriate material to paint on, and then, in a great flash of inspiration, I got it: the beach stones! I understood that these little particles of huge rocks, treated by Water, Sun and Wind Powers, perfectly match my purpose. It became obvious to me that I could recreate the bygone cultures’ images on these little shreds of ancient "earth bones". Now I spend much time wondering on the shores of Caesarea and Acre (Israel), of the Peloponnese (near Kalamata, Greece), Cote d’Azure (near Nice, France), Nahant and Rockport (Massachusetts), while searching for proper pebbles, looking for desired shapes, sizes, textures and colors. I fell in love with pebble’s delicate natural colors that often seem like subtle suede (chamois) or dachshund skin. Their surface sometimes is smooth and flat, and sometimes rough and knobby, but always so pleasant to touch. After the gathering is done, I sort my collected treasures by size and color. Then I clean and wash them. I do this with great love and care. When I start to paint on a stone, I am feeling great joy as if I am back to the early days when the earth was young, air and water were pure, and everlasting forests were still untouched. I feel like the first man on Earth. Every particular stone almost invites its own distinct image. Stone's curves, natural hollows and incrustations, homogenous or diversified color, impregnations and stains, game of Light and Shadow on its surface - all these powerfully suggest the choice of artistic subject and style. I draw outlines with a fine black line. Still vague image slowly becomes clear, coming out against a pale grey, pale cream, or pale fawn colored background. Then I put the first layers of transparent watercolors, using a subtle brush. Afterwards, I work hard on the details, using watercolor and pastel pencils. Painting miniature patterns of clothes and adornments, subtle lines of faces and hands, fine details of ornaments, animal's skin and fur, bird's feathers, and insect's stalks - all is a very precise and laborious task. And closer to the end, I add some color highlights, emphasizing accents where needed. When the main image is ready, I work out secondary motifs. Usually, these are universal symbols originating from pre-historic cultures and ancient civilizations - Egyptian, Sumerian, Assyrian and others. While creating a Zodiac sign, I often write its name in hieroglyphs, cuneiform or Phoenician characters (after consulting special literature, of course). 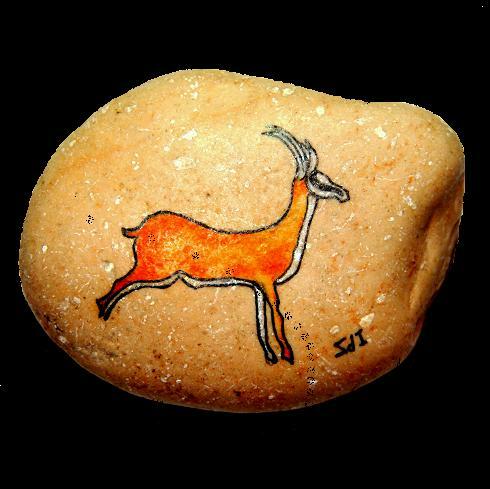 And every time I finish painting on a stone, I get a strong feeling - now I am in full harmony with the surrounding world!